Payment options : credit and debit cards. Available languages : English, Spanish, Russian, Korean. Customer support : direct email address, contact form. According to the small print at the bottom of the Lotto Ball website, all trademarks on the site seems to be owned by Calottery.com. The website is an independent online lottery service provider that offers lottery players 6 different lottery games operating out of California. These games include Daily 4, Daily 3, Supper Lotto plus, US Powerball, Fantasy 5, and Mega Millions. 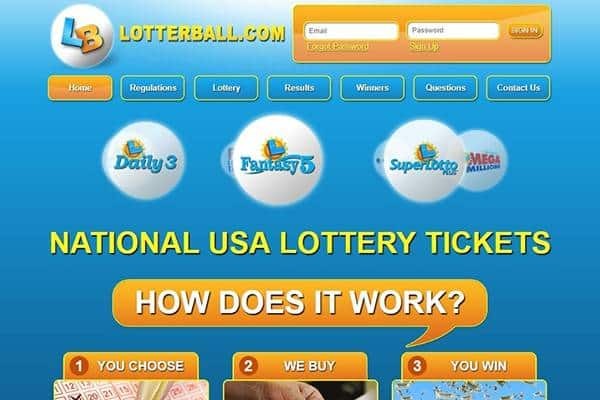 The website offers all these lotteries for a small flat fee of $1.33, which is the service charge that is placed on the face value of each ticket bought on the site. The website has a number of gimmicks and some pop-up window on its homepage. It also has a side window that pops out to offer players tutorials on how they can play the lotteries on the site and win. It also has a connect to YouTube option that seems to be all over the page that says their rules and regulations, with each link leading a collection of screenshots that shows players a pictorial explanation of things already stated on the rules page. 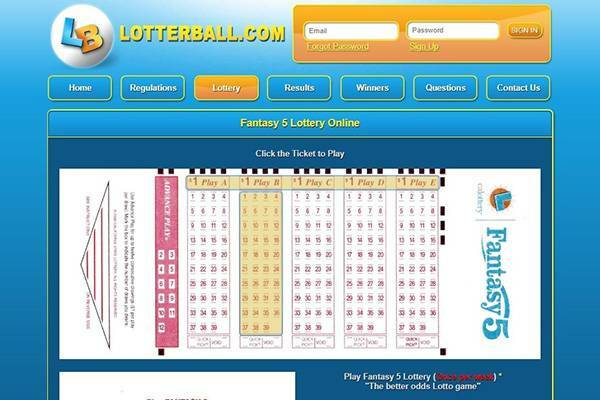 As mentioned earlier, Lotter Ball offers players a chance to win from six different lotteries – Fantasy 5, Daily 4, Daily 3, US Mega Millions and Powerball, and the Super Lotto Plus, which are all ran out of California. However, a service charge fee of $1.33 is placed on each ticket bought on the site. The website has only Desktop support, there’s no responsive design to “fit” tablet or mobile devices. It is completely unfriendly for user using their smart phone. There’s no mobile apps, not that I expected a mobile app for a service not using the web technological standard. I couldn’t find promotions as Lotter Ball only has a ticket carrier service and this means they can’t offer a discount on the lottery ticket price – they also have to charge extra for the manual process of completing a ticket purchase in a brick and mortar lotto kiosk. Once a player wins a cash prize of up to $600, the winnings are paid straight to their bank account within the space of 2 to 3 days after the draws. On the other hand, if a player gets a winning that is above $600, the player gets a cashier’s cheque as soon as the lottery they played pays out. One of the amazing things about this site is that if a player wins the big jackpot, they get to travel all the way to California to pick up the cash themselves. This is an awesome feature that brings more players to the site. The California lotteries offered on the site are made open to any player outside California to play, and California is one of the very few states whose lotteries don’t have state taxes placed on them. However, federal taxes are applicable to these lotteries. But the website does not state whether or not service charges are placed on player’s winnings. For players to join in the lotteries available on the Lotter Ball website, they must be above 18 years of age and must have thoroughly read the terms and conditions on the website. A registration form must be filled online and submitted, after which a confirmation email will be sent to the user’s mail. Once the registration process has been completed, players can then purchase tickets from the available lotteries on the site and then select a payment method to confirm their purchase. One of the downsides to this website is the fact that it only has PayPal has its accepted method of payment. And one thing to take note of is that once tickets have been confirmed as “bought”, they cannot be refunded no matter what. 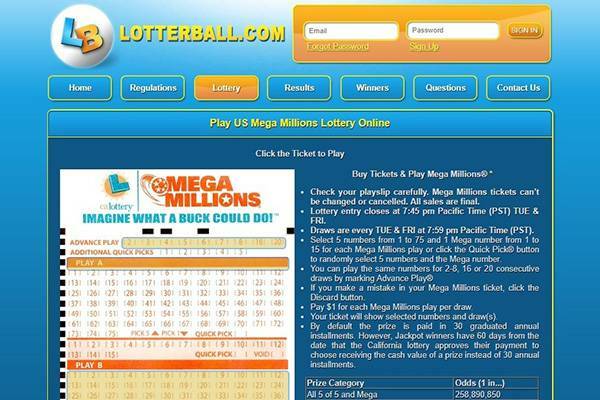 So players have to be extra cautious when buying their lottery tickets on this site. Anyone looking for some information of the service might find it in a short questions page or a regulations page. Reaching customer support is possible using either a direct mail or contact form that are available on the contact page. Is LotterBall legit or fraud? There’s no indication of a fraudulent or illegitimate operation, this doesn’t mean it won’t commit a scam if a big winner comes along. As mentioned, there’s no negative signals, but there are no confirmed jackpot winners that successfully claimed a reward. They offer a service that is becoming less and less available, for those who insist on purchasing a ticket, this is a good option. 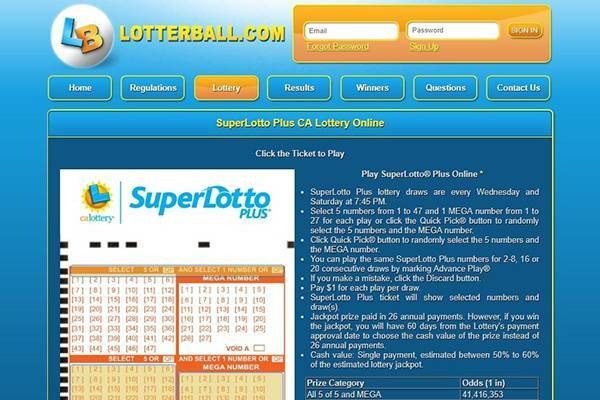 Though their website does not do much justice on telling players who they are or what happenings to winnings, Lotto Ball offers 6 of the best lottery games operating out of California without state taxes being placed on them. These lotteries include Fantasy 5, Daily 4, Daily 3, US Mega Millions and Powerball, and the Super Lotto Plus, with a service charge of $1.33 placed on each ticket. 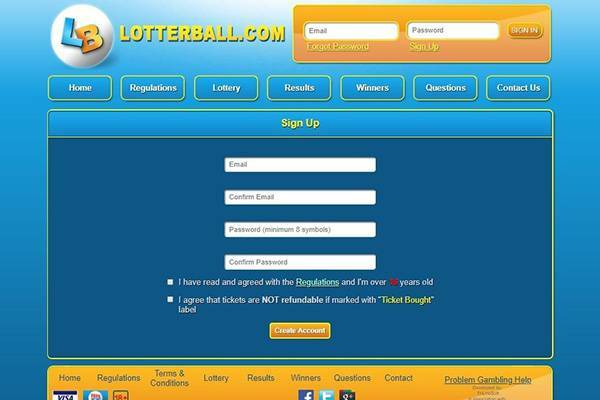 All players have to do to have an account on LottoBall.com is to be 18 years old and above, fill in an online registration form, and once that is completed, they can select from the list of available games and pay using PayPal. For winnings below $600, a cashier cheque is issued to the players, however, if the winnings are above $600, players have to go all the way to California to claim their prize. 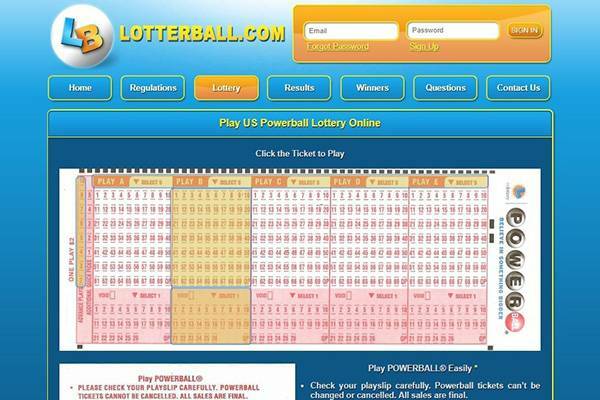 The website is a simple and easy-to-use lottery website.